Hollandaise was served with Salmon Steaks  at the Glen-Mor Restaurant. This sauce can also be served with eggs for breakfast, traditionally as Eggs Benedict. Melt butter and set aside, let cool slightly. 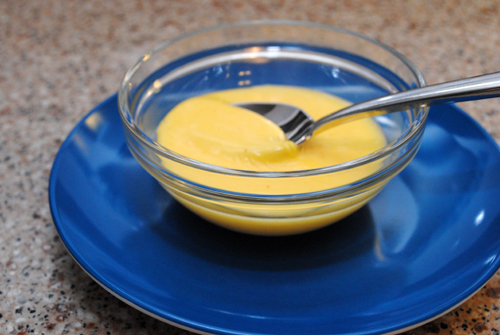 In the top bowl of a double-boiler, beat egg yolks in a small mixing bowl. Bring water in a double boiler to a simmer. Place beaten egg yolk bowl on top of simmering water and stir with a whisk. Add melted butter and continue stirring continuously. Stir until sauce thickens, but be careful not to let the eggs start to cook. If eggs cook and the sauce becomes lumpy, the recipe will need to be remade from scratch. Add lemon juice, salt, and pepper, and adjust seasoning to taste. Remove sauce from heat, but keep warm. Sauce will separate as it cools. Serve sauce with fish, like Salmon Steaks with Hollandaise Sauce  or with eggs for a breakfast dish. Copyright © 2011 Recipe Originals. All rights reserved.